I worship Her, the beloved of varadharAjap perumAL, who is distinguished by SEshathva (servitude), pArathanthrya (total dependence) and ananya bhogyathA (enjoyed by Him only) only unto Him, who evolves and conducts all the spheres and dwells in the Lotus. I reach Her as my only Refuge, Who is the most appropriate in form, spirit, qualities, greatness, effulgence, richness,and unblemished character for SrIman nArAyaNan, filled with countless auspicious qualities, apt with six auspiciousness to be addressed bhagavathi, named SrI, my beloved Mother as I do not have any other as refuge. May we surrender unto SrI mahAlakshmi, who by Her playful glances makes all the seven worlds flourish well, and is the bright auspicious lamp enlightening the grand palace of SrIrangam as the divine consort of SrI rangarAja. 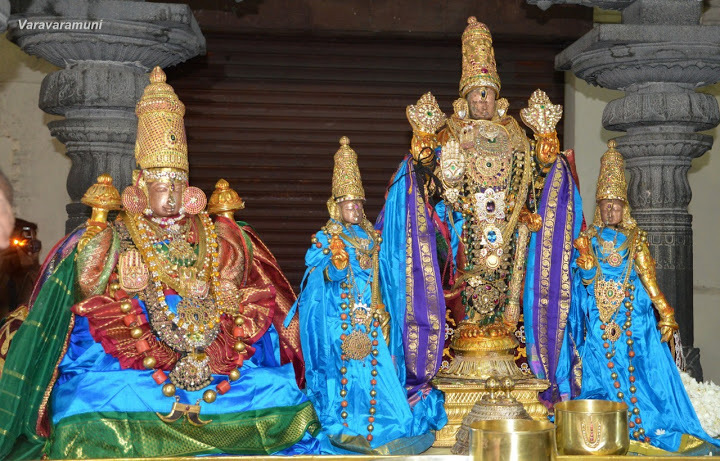 I worship Sri Mahalakshmi, who feeds the breast milk of knowledge to all out of here playful glances, who is the very form of the compassionate Grace of SrI SrInivasa, lending Him the greatness (staying firmly in Him). This entry was posted in chathu: SlOki, Other on December 4, 2015 by Sarathy Thothathri.